XL Snappy Seat Back to replace standard contoured seatback. XL Seat Back for Snappy Seat System. The XL Seat Back accomodates larger riders that do not need the contour back. It measures 13 inches wide by 16 inches high. 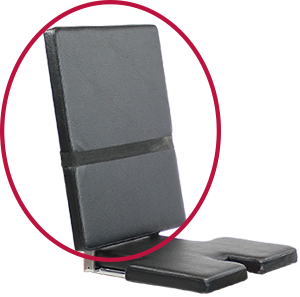 Laterals, headrest and H-Harness cannot be used with the XL Back. Generally used in conjunction with the notched snappy seat wide bottom as shown in image. Snappy_Seat_Assembly.pdf Be the first to leave a comment for this product.